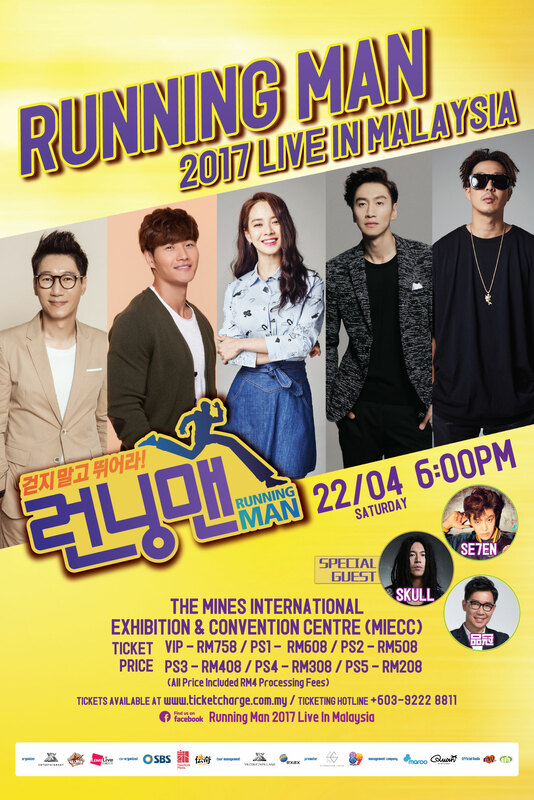 RUNNING MAN to Bring Surprises Live on Stage at MIECC, April 22nd! Organised by YS Entertainment, RUNNING MAN 2017 LIVE IN MALAYSIA set to vow fans with full surprises at The Mines International Exhibition & Convention Center (MIECC) on 22nd of April 2017 6PM. Ever since South Korea’s longest running popular variety show RUNNING MAN has embarked on their world concert tour in February 2017, the very own entertaining stars like Song Ji Hyo, Lee Kwang Soo, Kim Jong Kook, Ji Suk Jin, and HAHA will be meeting Malaysian fans very soon this April. Aside from the first announcement of Skull, the famous South Korean reggae singer as special guest, the organizer is announcing more surprises as new line-ups. International Korean singer who made it a success in various European and Asian countries, Se7en and Victor Wong Pin Kuan, Malaysian born Chinese singer, who made his name well in the Taiwan music scene since 90’s will be appearing as special guests as well. Kim Jong Kook had released a Mandarin Single numbered “Don’t Need To Return My Love” in January 2017, which he did a special crossover with Malaysian Chinese Singer, Victor Wong. Kim Jong Kook fell in love right away with Victor’s composition of the song, hence the crossover. Besides the wonderful chemistry from the song they made, you could enjoy the lovely vocal of Victor Wong on stage during the concert. Since the commencement of ticket launch on March 29th, VIP and PS5 tickets snapped up in minutes. In order to show gratitude towards fans’ great support, VIP and PS1 ticket purchasers will receive complimentary official light stick. VIP ticket holders will also entitled for a chance to get close with the 5 members of RUNNING MAN. For other ticket purchasers will also get a complimentary concert poster on the day itself.